One in five Canadian renters spend more than half their income on shelter alone. Nearly a fifth of Canadian renters spend more than half their total income on their rent, according to an analysis from Harvard University that suggests governments may want to get back into the business of building affordable housing. Canada joined the U.S., Spain and U.K. among the countries where the largest shares of the population spend more than half their income on shelter alone. The 50-per-cent mark is the threshold for “severe” housing unaffordability, as defined by the U.S. Department of Housing and Urban Development. 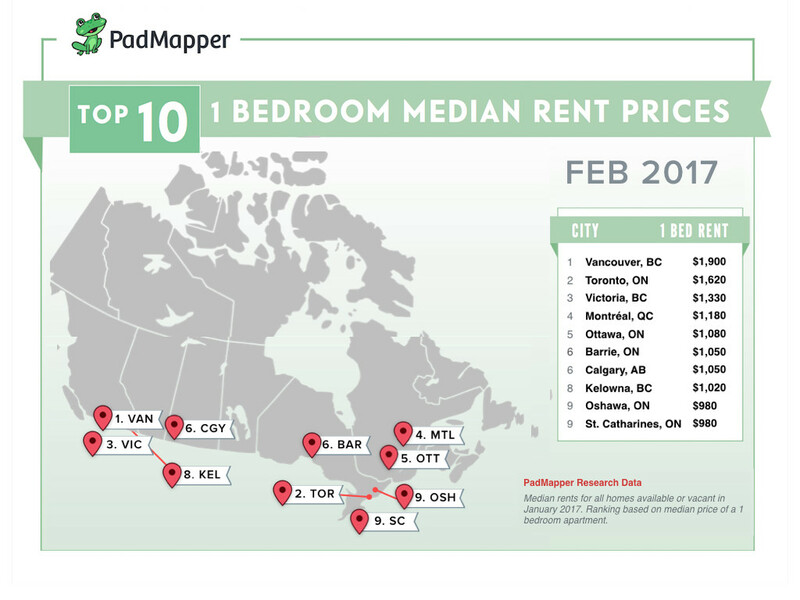 The study from Harvard’s Joint Center for Housing Studies uses Canadian data from the 2011 National Household Survey, meaning it doesn’t take into account the run-up in rental rates in recent years, particularly in Toronto and Vancouver, the two metro areas where severe affordability problems are most concentrated. Those two cities have seen rapidly rising rental costs amid an apparent shortage of home sale listings. The researchers put forward a few explanations for why some countries’ rents are burdened much more than others. One simple one is that rental apartments, on the whole, are larger in the U.S. and Canada than most other countries. But the paper also squarely points the blame on governments’ willingness to address economic inequality. 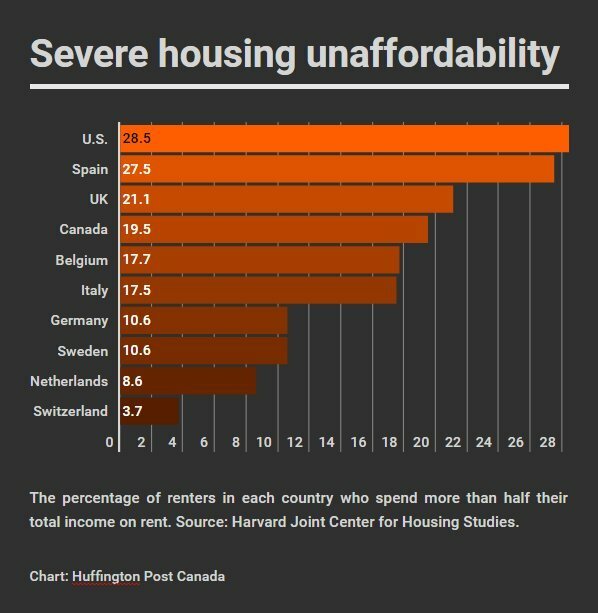 It notes that housing subsidies and allowances are less generous in the U.S. and Canada than in many other developed countries. “The U.S. provides fairly generous housing benefits to only a small share of needy households,” authors Michael Carliner and Ellen Marya wrote in the paper issued last fall. As others have argued, the paper notes that in countries where rents are more affordable, governments or non-profits are involved in developing affordable housing. After a decades-long dry spell, some Canadian cities are starting to build affordable housing once again. This magnificent ski-in / ski-out log cabin on the slopes of Hudson Bay Mountain is the consummate image of leisure à la Canadiana. The Hudson Bay Mountain Chalet comfortably sleeps up to nine and with its gourmet kitchen and full entertainment system is a prime spot for family or other group retreats. Walk out your front (or back or side) door and ski and snowboard Hudson Bay Mountain, snowshoe or ski tour to Crater Lake, or cross-country ski at the Bulkley Valley Nordic Centre. Rates start a $75 per person per night. Photo by Mara Sofferin. Hand-built and operated by the Christie/Hamilton family, Falcon Trails Resort offers two types of cabin rentals in the heart of Manitoba’s Whiteshell Provincial Park. There are nine hand-crafted timber-frame cabins on the shores of Falcon Lake, each of which sleeps up to five people and boasts cathedral ceilings and loft bedrooms. For a more remote retreat, there are six luxury eco-cabins on neighbouring High Lake, which are exclusively accessed via a backcountry hike through the boreal forest. Visit the drool-worthy Falcon Trails Instagram feed for closer look. Rates start at $145 per night. Photo by Mara Sofferin. If you’re one of the over two million people who plan to stay overnight in Banff this year, don’t skip the opportunity to shack up in this one-of-a-kind cabin rental. It sleeps two and stays include breakfast in bed each morning, making it perfectly suited for intimate romantic retreats. Located in the heart of the Canadian Rockies, the Banff Log Cabin is one of the park’s historic properties, hand built in 1974 and now operated by longtime Banff residents Sharon & Malcolm Carmichael who not only provide guests with bonafide Canadian R&R but also invaluable insider suggestions for enjoying the village and park. Rates start at $250 per night. Photo by Malcolm Carmichael. Surrounded on all sides by kilometres of Crown Land, Snowshoe Camp Resort has six two and three bedroom cabins, remotely situated on Wakomata Lake in Northern Ontario's Algoma Country amid a network of snowmobile, cross-country ski, and snowshoe trails. Wakomata Lake is one of the Ontario's ice-fishing hotspots, home to Lake Trout, Small Mouth Bass, Pike, Whitefish, Ling, and Perch. Rates start at $130 per night. Photo by Mara Sofferin. Located right in Saskatchewan’s spectacular Grasslands National Park, The Crossing is a charming farmhouse with three pet-friendly, self-catering vacation suites. Grasslands National Park is Canada's only national park preserving the unique ecology of the prairie grasslands. It is also one of the 10 quietest places in all of North America and classified as a Dark Sky Preserve, offering pristine views of the Milky Way and northern lights. Rates start at $105 per night. Photo by Neil Ward. Bear Paw Ranch is the most remote destination on this list, a hidden gem on the scenic and secluded stretch of the Cassiar Highway between Smithers and the Yukon. The ranch is a small Tyrollean Village, comprised of a 13-room Austrian-style lodge and six rustic private alpine cabins. Bear Paw Ranch is a home base from which to tour the vast Northern wilderness via snowmobile, snowshoes, ice-fishing and heli-skiing. The lodge’s genial builders and owners, Tony and Doris, will help facilitate any adventure you have in mind. Rates start at $110 per night. Photo by Mara Sofferin. Valemount, British Columbia is Jasper’s off-the-beaten path counterpart, and the family-friendly Teepee Meadows is its crown jewel. Set on 40 acres of gardens and orchards, its homey guest cottages, the largest of which can sleep up to 10, share the property with a hobby farm inhabited by huggable horses, ponies, donkeys, llamas, chickens, fowl, dogs and cats. Teepee Meadows borders Mount Robson Provincial Park, home to Mount Robson, the tallest mountain in the Canadian Rockies and a fantastic – and uncrowded – site for winter sports. Rates start at $110 per night. Photo courtesy of Teepee Meadows. Lovingly developed by artist Cathy Orr and her partner Linda Thomas, the Crooked Mountain Cabins are just 2.5 hours from Winnipeg and offer a peaceful alternative to Wasagaming, the comparatively congested National Park townsite. Crooked Mountain's four quaint cottages offer an authentic Canadian travel experience, positioning visitors right in the rolling hills of Riding Mountain National Park, 3,000km² of pristine meadows, valleys, lakes and streams inhabited by wolves, moose, elk, black bear, owls, and bison. Rates start at $150 per night. Photo by Cathy Orr. If you’re looking for a taste of simple living look no further than Manitoba's Rossman Yurt, lakeside digs right outside of Riding Mountain National Park. The 450 sq. ft. winterized yurt comfortably sleeps five and the experience is somewhere between camping and cottaging. There are no toilets, showers, or running water (all of these are available at a nearby campground), but the sleeping quarters are anything but rustic. The plush queen sized bed has a pillow top and down comforter, and the living space has a sofa bed, kitchenette, dining table, fireplace, and BBQ. Rates start at $80 per night. Photo by Thomasina Charney. Bound on three sides by Lake superior – which looks more like an ocean than a lake – The Lookout is an eco-friendly sanctuary that sleeps three and bestows visitors with 15 acres of backcountry terrain and 2,300 feet of private shoreline to explore and admire. The surrounding Sleeping Giant Provincial Park offers some of the best cross-country skiing in Ontario with 50km of groomed trails. Rates start at $235 per night. Photo by Mara Sofferin.